The Department of Anthropology offers a full range of courses in archaeological, biological, social, cultural, psychological, political and linguistic anthropology. Courses include offerings that focus on specific societies or regions of the world as well as more theoretically oriented topics. The Anthropology Department currently offers a Bachelor of Arts degree in Anthropology (B.A.) in the concentrations of: Archaeology, Biological Anthropology, Climate change and Human Solutions Anthropology (Effective Fall 2019), and Sociocultural Anthropology and effective Fall 2019, a Bachelor of Science degree in Biological Anthropology (B.S). All courses must be taken for a letter grade of C- or better. ONE ANSC w/region, country or religion focus in addition to above courses. (See course titles and options below). FIVE upper division Anthropology courses from any category. *Students may apply one Independent Research course (ANTH 197, 198, 199) towards their major elective requirements. Upper Division Residency Requirement: Students must complete a minimum of seven major courses at UC San Diego. Overlaps: Lower division courses may overlap between your major, minor and college requirements. Students may overlap two upper division courses between your major and minor by submitting a request in the VAC (some courses may automatically overlap). A maximum of four study abroad courses may be petitioned for credit toward the major. What are the differences in the concentrations? Anthropological Archaeology The undergraduate program in anthropological archaeology incorporates comparative introductory courses; advanced theoretical and topical courses in our areas of expertise, field schools in Jordan, Israel, Peru, San Diego County and Puerto Rico, and archaeologically-oriented study abroad programs in Egypt, Mexico, Central America, Italy, Malta, and Spain. Undergraduate students also may gain research experience working in our laboratories, through the Faculty Mentor Program, through Academic Internship Program (AIP) internships at the San Diego Museum of Man, San Diego Archaeological Center, and California State Parks, and through the Senior Honors program in Anthropology. Biological Anthropology at UC San Diego addresses the evolution of the culture-bearing capacity in humans and closely related species from a strongly comparative perspective. Humans, today, are a super-dominant species. How we got this way fires up public and scientific imaginations; yet while there are many theories and speculations about our origins none has yet provided a full explanation of our evolutionary history. The difficulties go beyond the mere facts to profound philosophical issues including ones extremely relevant to the modern human predicament. We believe that the answers can come only from the type of intra-, inter-, and cross-disciplinary collaborations we represent. We aim to understand the origins, organization complexity and socioecology of nonhuman primate societies. We explore the relationship between socioecology and the neural substrates of complex behavior in primates. We study and reconstruct subsistence strategies of humans and nonhuman primates within varied environments and social systems. We consider the constraints or consequences of food resources (energy availability) on energy expenditure and neural organization. We are involved in applying our scientific knowledge to the conservation of primate species and habitats. We emphasize bioarchaeology in reconstructing prehistoric human diet, ecology, and migration patterns. We bridge with neurosciences and cognitive science in investigating the neural substrates of cognition in humans. The faculty and students in sociocultural anthropology at UC San Diego share a basic concern with the shaping and reshaping of human life. We examine the forces and structures that regulate life as well as the ways that groups of people instantiate, modify and occasionally overturn such powerful geographical and historical tendencies and logics. Among the concerns reflected in our teaching and research are: colonial and imperial relations; capitalist restructuring and state transformation; rivalries around definitions of progress and development; shifts in paradigms of knowledge production as well as ethical and aesthetic benchmarks; struggles over how to mark and record competing histories, memories and desires, and the uneven patterning of life around such distinctions as age, ethnicity, citizenship, gender, nationalism, race, religion, and sexuality. See what research our faculty are currently involved in! You can also plan out your courses by using the College and Major Planner. To see which classes you still have remaining, please view your degree audit, a tool in TritonLink that lists degree requirements and measures progress toward completing them. Review our "How to Read Your Degree Audit" guide for more information. How do I enroll in ANTH 198/199? How do I double major in Anthropology? Complete a Double Major Petition and attach a brief statement of purpose (reason why you are completing 2 majors). Take your petition to the advisor for each major to review your plan and obtain their signatures. For additional information see Declare a Double Major on Blink. * All lower division courses can count towards both majors. * 10 upper division courses must be unique to each major. How do I request pre-authorization to enroll in Anthropology courses? For course clearance, please submit a Course Pre-Authorization Request. How do I add the major? 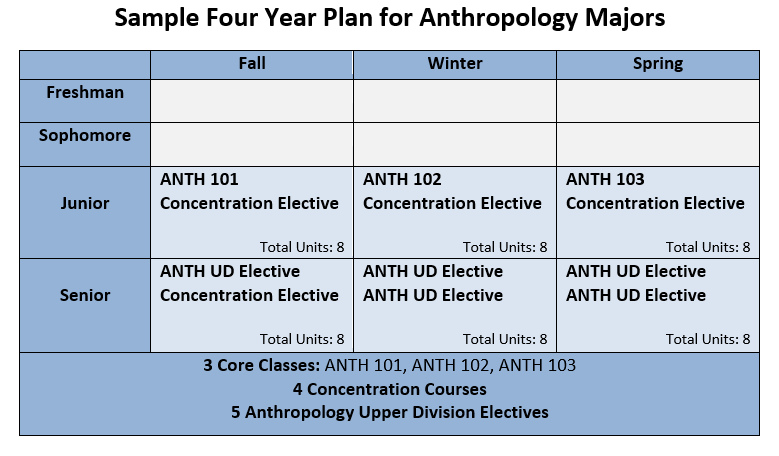 You can apply for Anthropology major at any time by using the Major/Minor tool.